It was raining heavily when I left home to travel to our meeting point outside the National Gallery of Scotland. There were a few panic phone calls asking if the walk was cancelled because of the weather and the gloomy weather forecast. The answer of course was no we were walking whatever the weather! 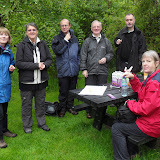 We caught the bus to Balerno and by the time we reached Balerno the rain had stopped. We were joined by two other walkers making our group into a total of seven. Our first stop was a quick visit to Malleny House and then through the woods to begin our walk across the Pentlands to Flotterston. We were very lucky with the weather experiencing just a few spots of light rain throughout the walk. We arrived at the Flotterston Inn at 12.30pm where we met those who were joining us for lunch. After a drink in the bar we made our way to a private dining room for an excellent buffet lunch. Another successful event for KTDO completed!